Today, we launch an early preview of the new Android extension libraries (AndroidX) which represents a new era for the Support Library. Please preview the change and give us your feedback. Since this is an early preview, we do not recommend trying this on any production projects as there are some known issues. The Support Library started over 7+ years ago to provide backwards compatibility to framework APIs. Over the years, the library has grown to include device-specific UX, debugging, testing and other utilities. The adoption of the Support Library has been phenomenal; most Android apps use the Support Library today. We want to increase our investment in this area, and it is critical that we lay a solid foundation. In that vein, we took a step back and chatted with many of you. The feedback has been consistent and unanimous; the organic growth of the library has become confusing. There are components and packages named "v7" when the minimal SDK level we support is 14! We want to make it clear for you to understand the division between APIs that are bundled with the platform and which are static libraries for app developers that work across different versions of Android. With that in mind, say "Hello World" to "AndroidX". As previously noted in the Android KTX announcement, we are adding new features under this package, and updating some existing ones. Classes like AppCompatActivity or ViewModel, which are unbundled from the operating system and ship in your apk. These libraries are written to provide a single API surface with behavior that's as consistent as possible across Android versions. Many times, unbundled libraries can be a better choice, since they provide a single API surface across different Android versions. This refactor moves the unbundled libraries - including all of the Support Library and Architecture Components - into the AndroidX package, to make it clear to know which dependencies to include. We redesigned the package structure to encourage smaller, more focused libraries that relieve pressure on apps and tests that aren't using Proguard or Multidex. Maven groupIds and artifactIds have been updated to better reflect library contents, and we have moved to prefixing library packages with their groupId to create an obvious link between the class that you are using and the Maven artifact from which it came. Additionally, following the introduction in 28.0.0-alpha1 of Material Components for Android as a drop-in replacement for Design Library, we have refactored the design package to reflect its new direction. For a complete listing of mappings from 28.0.0-alpha1 (android.support) to 1.0.0-alpha1 (androidx), please see the full AndroidX refactoring map. Please note that there may be minor changes to this map during the alpha phase. Starting with the AndroidX refactor, library versions have been reset from 28.0.0 to 1.0.0. Future updates will be versioned on a per-library basis, following strict semantic versioning rules where the major version indicates binary compatibility. This means, for example, that a feature may be added to RecyclerView and used in your app without requiring an update to every other library used by your app. This also means that libraries depending on androidx may provide reasonable guarantees about binary compatibility with future releases of AndroidX -- that a dependency on a 1.5.0 revision will still work when run against 1.7.0 but will likely not work against 2.0.0. 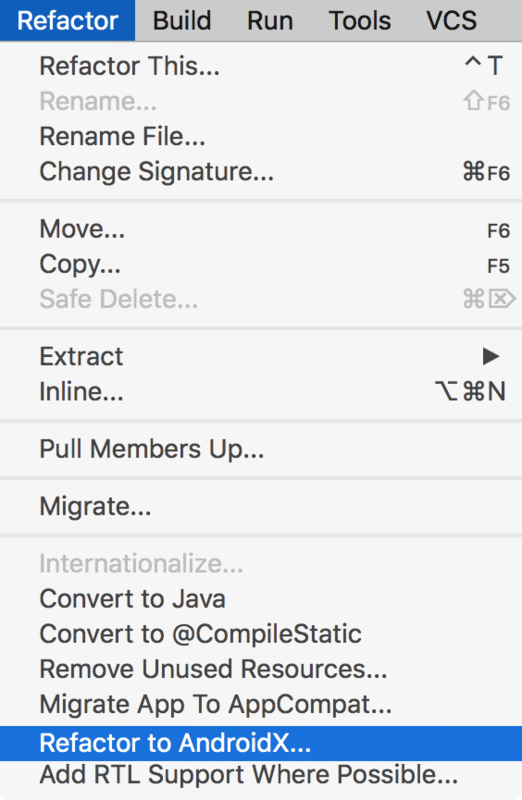 Moving your app from android.support to androidx-packaged dependencies has two major parts: source refactoring and dependency translation. Source refactoring updates your Java code, XML resources, and Gradle configuration to reference the refactored classes and Maven artifacts. 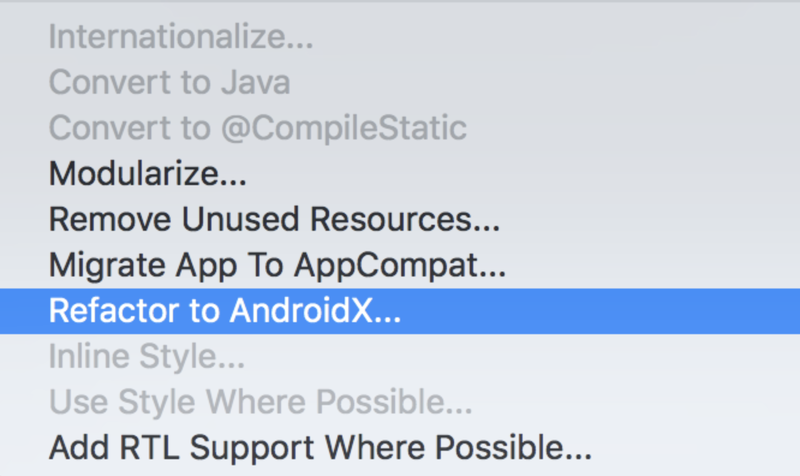 This feature is available in Android Studio Canary 14 for applications targeting Android P.
If you depend on a library that references the older Support Library, Android Studio will update that library to reference androidx instead via dependency translation. Dependency translation is automatically applied by the Android Gradle Plugin 3.2.0-alpha14, which rewrites bytecode and resources of JAR and AAR dependencies (and transitive dependencies) to reference the new androidx-packaged classes and artifacts. We will also provide a standalone translation tool as a JAR. We understand this is a big change for existing projects and codebases. Our intention is to provide a strong foundation that sets Android library projects up for more sustainable growth, better modularity, and smaller code size. We hope that these changes also make it easier for developers to discover features and implement high-quality apps in less time; however, we understand that migration takes time and may not fit into everyone's production schedule. For this reason, we will continue to provide parallel updates to an android.support-packaged set of libraries for the duration of the P preview SDK timeframe. These updates will continue the 28.0.0 versioning scheme that began with 28.0.0-alpha1 in March 2018, and they will continue to be source-compatible with existing projects that depend on the android.support package. The stable release of 28.0.0 will be the final feature release packaged as android.support. All subsequent feature releases will only be made available as androidx-packaged artifacts. We'd love to hear from you as we iterate on this exciting future. Send us feedback by posting comments below, and please file any bugs you run into on AOSP. We look forward to a new era of Android libraries!